These days, LEGOs are worth more than gold, and both adults and kids are still going crazy for them. 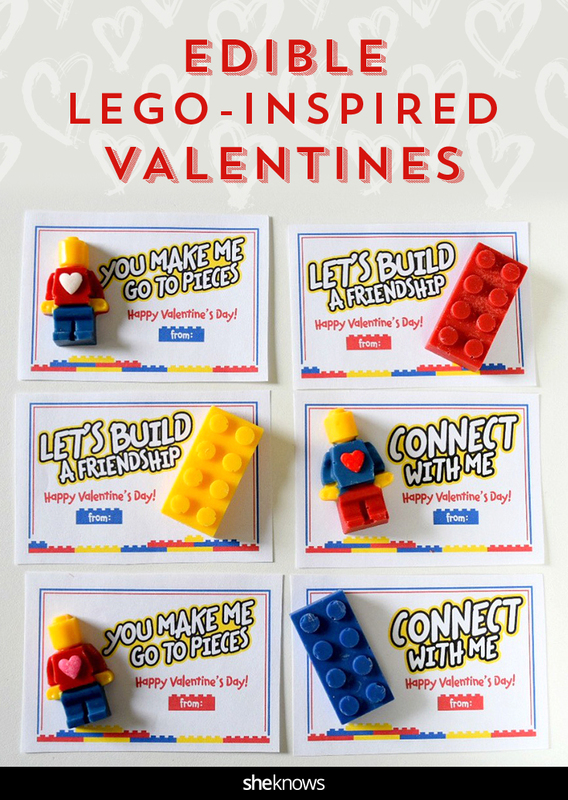 If you want to make Valentine’s Day extra special for the big (or little) kid in your life, surprise that LEGO lover with some adorable LEGO-like candies made from ice cube tray molds. If your kids and kids’ friends are like mine, they probably have an everlasting love of anything LEGO related. 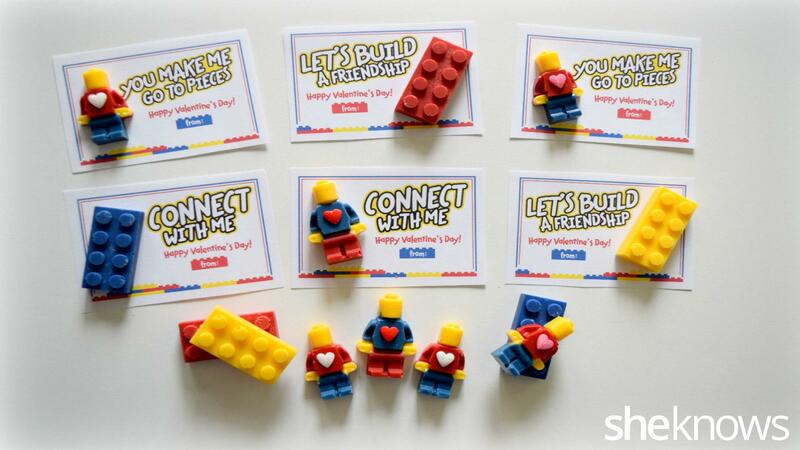 With a couple of ice cube trays and some candy wafers, you can make some LEGO-inspired bricks and LEGO-inspired minifigures to add to your valentines. Once you get the technique down, these little guys are easy to make. 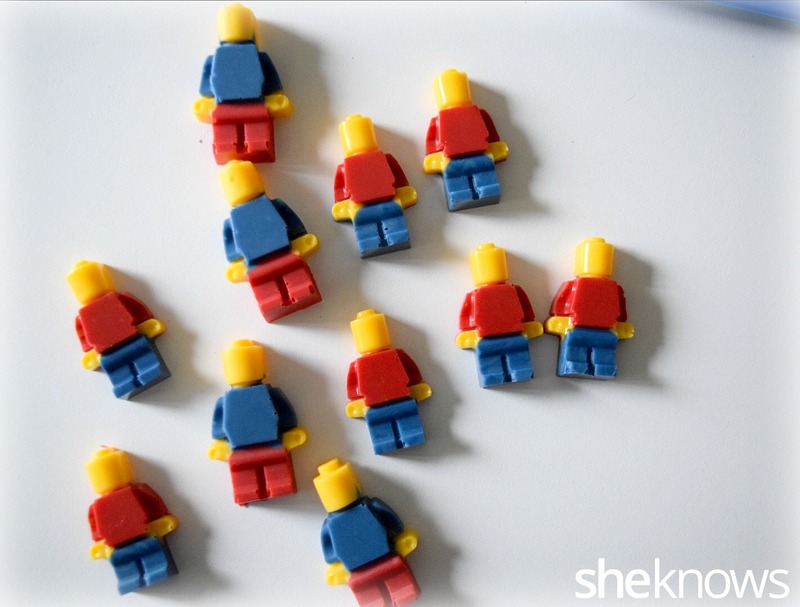 To make it super fast and easy, you can use just one color for the minifigures. To make your lives easier, there’s also a free printable to use for the Valentine’s Day cards. You can find the LEGO ice cube trays/silicone molds on Amazon or also at the LEGO store. A rainbow of candy melting wafers are available at most craft stores (stores like Target and Walmart also carry some colors now). If making 3 colors for the minifigures is a bit hard at first, you can always use a solid color, which would be just as fun. Add the yellow, blue and red candy wafers to separate quart-size freezer bags. In 20-second intervals, melt each color until all the candy is melted in the bag. Each color should be melted when you are ready to fill the molds. Starting with yellow, snip a small end from one corner of the bag, and “pipe” the candy into the head part of the mold. Fill it only halfway. Snip an end of the red candy bag, and fill the body part of the mold. Fill it only halfway. Snip an end of the blue candy bag, and fill the leg part of the mold. Fill it only halfway. Once all 3 colors are filled halfway, tap the mold gently on the counter to even out the colors and remove any air bubbles in the candy. Repeat steps 3 to 6 until the mold is filled. If the candy starts to harden, soften it again in the microwave in 20-second intervals until remelted. When the entire mold is filled, place it in the refrigerator for 10 minutes to let the candy harden. Once the candy has hardened, pop it out of the mold. Attach a sprinkle heart with more melted candy. Add the yellow, blue and red candy wafers to separate ziplock freezer bags. In 20-second intervals, melt each color until all the candy is melted in the bag. 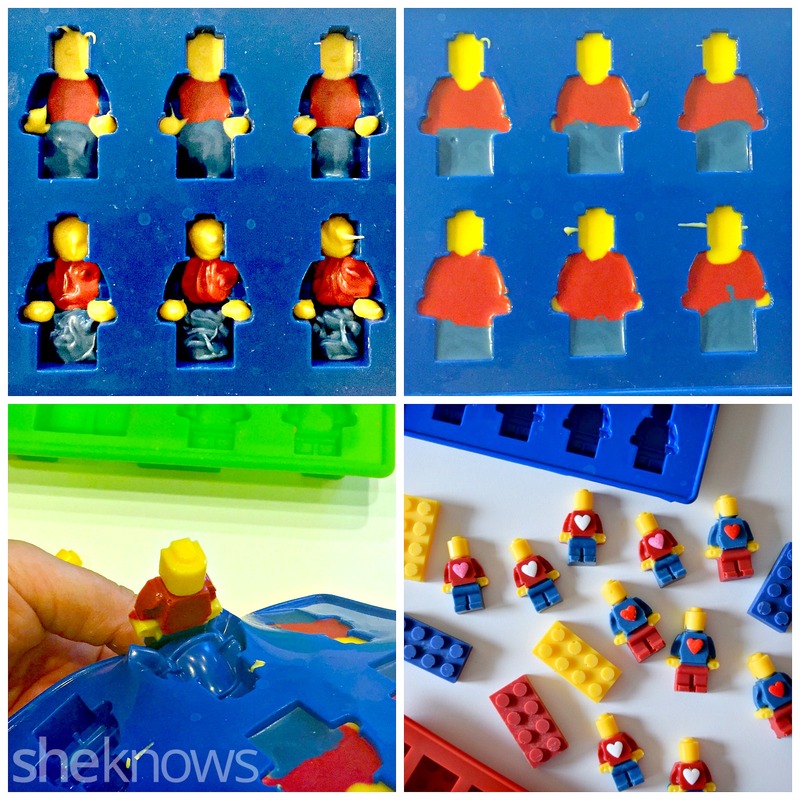 Fill the entire brick mold with 1 color (use whatever candy color you like, since bricks come in all colors!). Tap the mold when filled to even out the color and remove any air bubbles. Print 4 copies of the Valentine’s Day card printable onto cardstock, and cut out individual valentines. 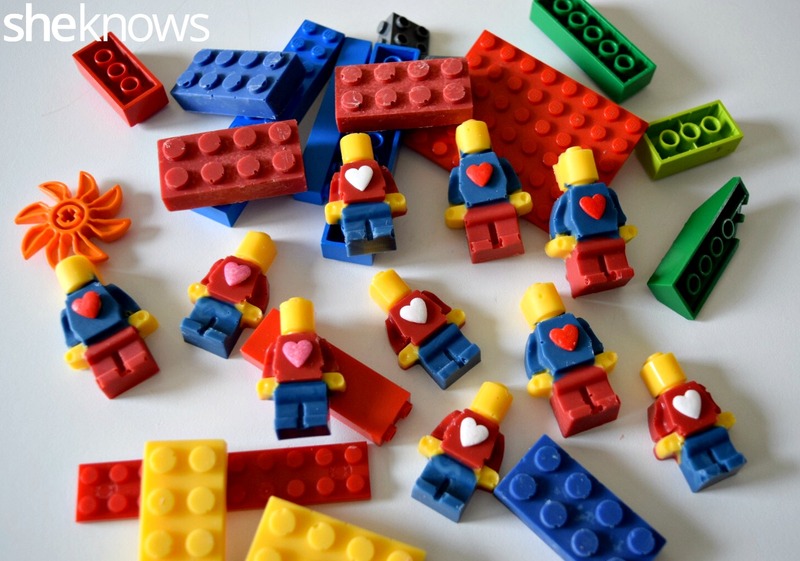 Attach LEGO-inspired candy to the valentines with some dollops of melted candy wafer. You can put the finished valentines into individual plastic sandwich bags, or wrap each in plastic wrap to give out on Valentine’s Day.